The Place Ever since I had Seng Kee Mushroom Minced Meat Noodle at The Lobby Lounge at Shangri-La Hotel Singapore, I have been keen to head down to the original stall in Serangoon Gardens. 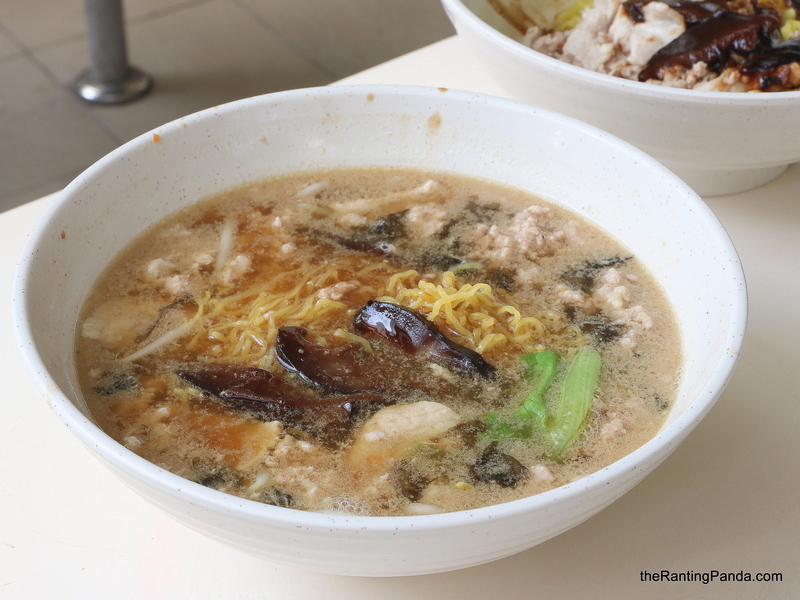 The popular food centre has no lack of good options, and it is by no surprise that there is often a beeline for Seng Kee Mushroom Minced Meat Noodle. The Food Famous for its Fish Maw Noodle and Fish Maw Soup, it sure does not come cheap at S$10 or S$12 by hawker fare standards. In any case, I believe the noodles itself is good enough and went ahead to order the usual Minced Meat Noodle Dry (S$4.50). The noodles is delicious. The whole noodle texture, tosses in the mix of sauce, retains that nice flavour. There is that slight bit of vinegar element, though it is not as overpowering as Tai Hwa. The flavourful mee pok noodle may also be attributed to the fact that the soup base used to prepare the noodles has some fish maw element in it. I also tried the Minced Meat Noodle Soup (S$4.50), which gives the version at Bedok 85 run for its money. I had mee kia for the soul version, which turns out to be a comforting soup for the soul. Coupled with generous minced pork and mushrooms, the flavour is wholesome and very well-balanced. Rants The waiting time. Budget about 20-30 minutes, which is still pretty decent compared to other popular stalls like Tai Wah Pork Noodle or Hill Street Tai Hwa Pork Noodle. Will I Return Again? The noodles and soup are excellent at Seng Kee. If you are craving for a hawker dish in Serangoon, this is the stall to go for.